Portuguese Hostel v Sintra, Portugalsko: Zarezervujte nyní! 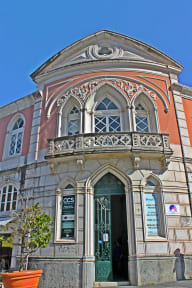 The Portuguese Hostel is located in the historic center of Sintra, 300 meters from the train station. This hostel offers accommodation with a good quality / price ratio and free Wi-Fi. It was used during the World War II for hospitality. Totally renewed in 2014. We are inspired by nature and our decoration was thought that way. The Portuguese Hostel provides access to shared bathrooms and accommodation in twin rooms, double rooms,triple rooms, and mixed dormitories with 5,8,12 Pax . There is a shared lounge with a flat-screen TV, sofas and a dining area. Guests can prepare their meals in the shared kitchen. Alternatively, guests can visit the traditional Portuguese restaurants located within walking distance. In Portuguese Hostel you will find comfort, hygiene, safety and an always available team to advise the top places to visit, as well as the finest bars and restaurants. We have excellent accessibility through public transportation, conventional buses and day and night taxis. The Portuguese Hostel provides access to shared bathrooms and accommodation in twin rooms, double rooms, triple rooms, or mixed dormitories. There is a shared lounge with a flat-screen TV, sofas and a dining area. 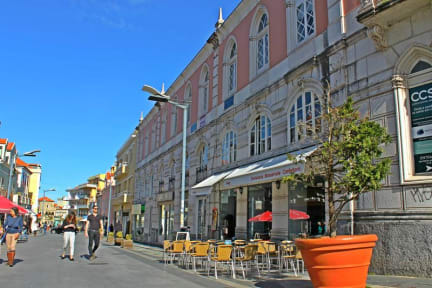 Portuguese Hostel Policies and Conditions. Cancellation policy: 48h before arrival, after this the entire amount of the reservation will be charged. Tax of 1 euro per person per night until 3rd night, for the forth night the tax will not be charged.